More images and a video after the break. 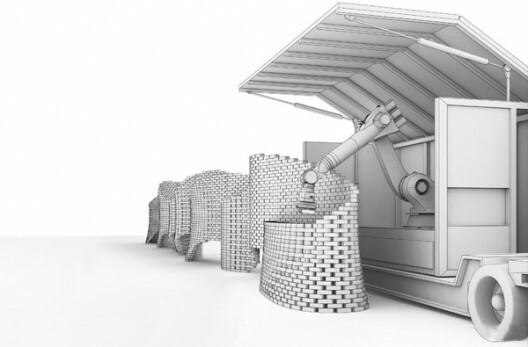 Developed through their research at ETH Zurich Faculty of Architecture, Switzerland, Gramazio & Kohler’s work explores highly complex architectural artifacts, built by industrial robots typically used to assemble automobiles and perform other high-precision tasks. The accuracy, strength and speed of these robots allow them to fabricate architectural forms of unprecedented complexity and intricacy. 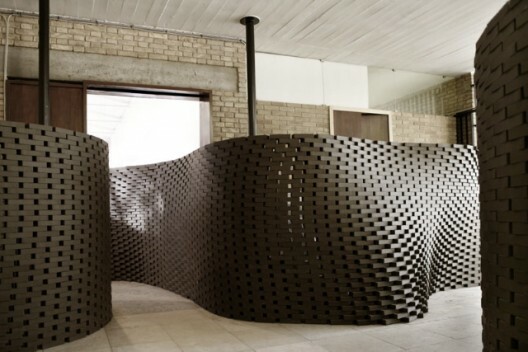 Gramazio & Kohler’s work represents the cutting edge of innovation in the field of digital fabrication in architecture. 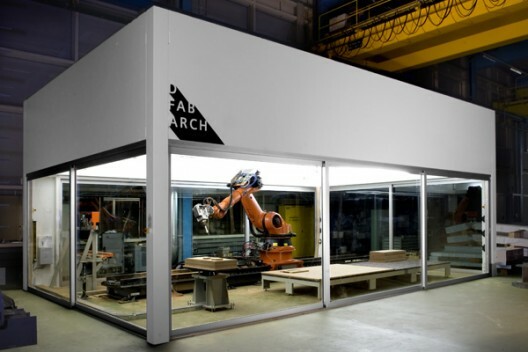 For many years architects have relied on digital manufacturing processes such as CNC milling or 3D printing as a tool for formal research at model-scale. For the first time, Gramazio & Kohler’s work explores the potential of mobile digital fabrication techniques that can fabricate at 1:1 scale on site. Projet similaire à ce que G&K avaient réalisés pour la Biennale d'architecture de Venise. Ici, la construction du mur, la cinétique du robot devient l'élément exposé. I’ve just finished working with Carlo Ratti and various cohorts on a great little project, which I hope might see the light of day here before too long. In the meantime, I thought I’d post this discussion I had with Carlo late last year, which was recently published in Architectural Review Australia. We met at the Metropolis Congress in Sydney, where Signor Ratti had just given a presentation on his work at the MIT SENSEable City Lab, an outfit whose work I admire hugely, working as they do across many of my interests: interactive architecture, urban informatics, responsive envronments, multidisciplinary design and other implications of real-time networked pervasive information systems for the city. Carlo Ratti and his colleagues at the SENSEable City Lab at MIT are doing as much as anyone to define a future of architecture. Ratti and I meet up at the Metropolis Congress in Sydney, where he has delivered a keynote on his projects, sandwiched between Saskia Sassen and Kathy Pain. Ratti’s presentation provided a strong counterpoint to Sassen’s impassioned yet personal world view, and Pain’s apparently analytical yet ultimately superficial ranking of cities. The work of his team was, in contrast, suffused with data emerging from the aggregate of millions of tiny signals. Yet it was often realised in lustrous visualisations that attempted the alchemy of transmuting data into information into knowledge, while shifting effortlessly from physical to digital to physical. Ratti, an architect and civil engineer by training, has ended up creating new urban forms from mobile phone signals, the movement of bikes and digitally-controlled jets of water. My own work, leading on ‘urban informatics’ for Arup in Australasia, is also getting our business into unlikely places, at both ends of the ‘design food chain’ and hovering around this intersection between physical and digital. The name ‘informatics’ will change, surely, just as talkies became movies, and Ratti talks instead of a “living architecture”, “liberated pixels” and “physical plus”. Yet we, and many others worldwide now, are all wrestling with the promise of digital activity thoroughly permeating urban fabric. Ratti is a tall, slender and slightly gangling arc of good-natured exuberance. He in no way belies Italian caricatures by gesticulating with a flourish as he talks, carving the air around him into sinuous forms, sweeping his hands to indicate progressive movements. Sitting in the culturally arid hub of Darling Harbour, we talk for a couple of hours, exploring the implications of this emerging field of design work, and how it may change the nature of both architecture, and also cities and buildings themselves. Just as with Ratti, his projects emerge from an intrinsically multidisciplinary environment. The Water Pavilion, for the Zaragoza Expo, was produced by a team of engineers, architects, sociologists and physicists, and built by Siemens. The presence of the social science disciplines is particularly interesting, enabling a focus on user behaviour in far more detail than is often the case with the built environment. As Ratti puts it, designing public spaces that are infused with informational activity means absolutely addressing “a new type of space and a new type of (augmented) physical body”, which is why he sees sociologists as so important, to help quantify some of these changes, and to monitor and understand them. I reflect that in industrial design and web design in particular it is far more common to have that sort of user research-led approach, but that it doesn’t often happen in architecture or urban design. 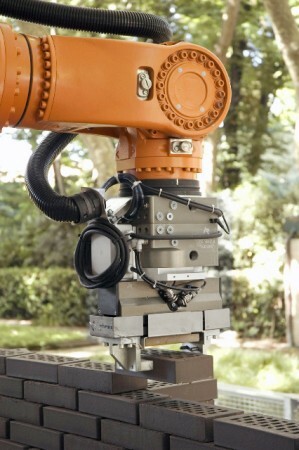 Though some architects have frequently indicated the possibilities of introducing industrial design techniques into architecture, others respond that buildings are generally one-offs, that “each building is a prototype”, and not mass produced as cars are (leaving aside the so far largely unrealised promise of prefab). Architecture can be very slow-moving by nature, partly as many basic conditions don’t change that much – such as the structural loads on buildings from wind or snow – and that materials tend to have a slow pace of change, with many years in between the introduction of concrete and that of ETFE, for instance. Whereas the world of consumer electronics, product design or, more obviously, online social software, can change radically almost week to week. Ratti notes that behaviour around these products flexes accordingly too, in a symbiotic relationship, and this must be understood in detail. At MIT, he benefits from a highly multidisciplinary environment, despite the silos universities can sometimes wrangle themselves into. Technological innovation can be situated in an environment where there can be “a dialogue between the technology side and the behavioural side – an interplay between the social and the technology”, as he puts it. With the SmartBiking project – in the context of a Copenhagen where 30 to 40 percent of all trips are already undertaken by bicycle – attempts to further promote the use of bikes need to genuinely develop new thinking over and above the pervasive provision of bike lanes. 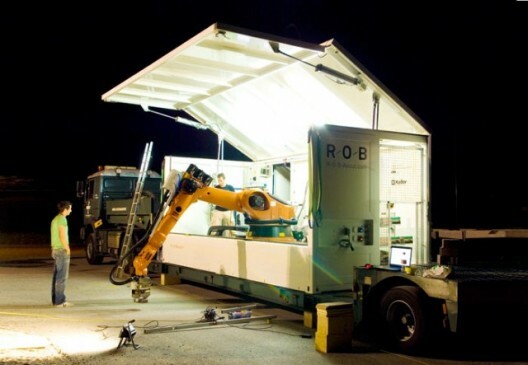 By looking at powerful connective tissue of social software networks, Ratti’s team – working with William J. Mitchell and others at MIT – is developing what they call “spatial smart wheels” that harvest energy when the rider brakes, within the context of a city-wide carbon trading scheme. Their sensor-enabled bikes connect briefly to other cyclists as they ride by, and then enable Facebook to play back the patterns of who passed who in the street that day. This is hardly the traditional work of the architect, yet this sense of working with a layer of soft infrastructure, overlaid onto the hard infrastructure of the city, is a theme common to this work. One thing that I consistently get asked by clients when I talk them through these kinds of changes is, “Yeah, but how will it change the physical form of cities? How will the cities look different?” I sometimes respond by referencing those other bike-sharing schemes in Barcelona, Paris, Lyon et al and illustrating how these are really informational services; soft infrastructure coordinated by informatics, and laid over the existing fabric of the city. Aside from hubs for the bikes, there are very few physical changes to the cities. Yet these systems have radically changed the sense of mobility in their cities, utterly changing the way the city feels. Ratti agrees, seeing that digital activity is a layer in interface with the city. It’s not a separate virtual space, as some seem to think, but it’s augmenting our physical space. As he points out, we’re hardly going to change or destroy all these existing buildings and spaces anytime soon – urban form just doesn’t change that quickly, but the profound changes in the way cities feel and function may be in this internet-enabled informational layer. And yet, Ratti is an architect (in practice with his Turin-based firm carlo ratti associati – Walter Nicolino & Carlo Ratti) and he is still drawn to creating new forms and shaping physical space. The Water Pavilion suggests a newly fluid, reconfigurable architecture, although with exterior walls comprising jets of water. 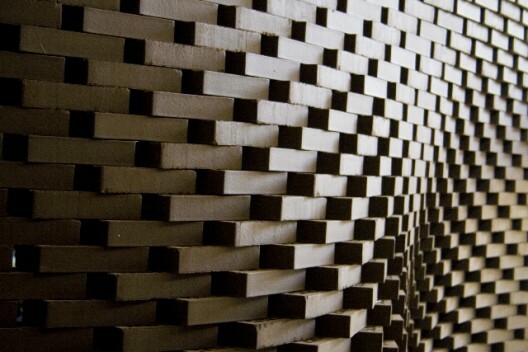 By controlling these jets – broadly, with a similar principle to ink-jet printers – words and shapes can be formed in the ‘walls’ and the walls themselves can appear and disappear from one second to another, such that the form of the building responds to people approaching it, shifting climactic conditions and other patterns of behaviour. In this sense, it’s beyond simply responsive architecture, and more genuinely interactive. Ratti describes these projects as exploring a new form of skin, which he sees has potential to be “reactive, responsive, more living”. He’s proud of how kids in particular responded to it, fluidly altering the physical space. “More Spacebook than Facebook,” he says, smiling. For the New York Talk Exchange (NYTE) project – a visualisation of global traffic over AT&T’s network, zooming from country to city to borough, to construct a kind of real-time census – the team included an urban designer, information designer, sociologist, exhibition designer, architecture student and a couple of advisers on the content itself. The latter was to advise the project on the content contained within the data, almost to avoid the team becoming seduced by the visualisation possibilities. Ratti believes this project begins to enable an understanding of the structure of cities from the fine-grain (even though the NYTE project could still be criticised for its lack of context, poor Dr Kathy Pain following Ratti’s presentation at Metropolis simply had no way of responding to this detail of data; the GAWC index of cities begins to look very old-fashioned as a result). Real-Time Rome provided another compelling example of these urban patterns, drawn from the aggregated mobile phone signals over the course of three days surrounding the 2006 World Cup Final between Italy and France. Using AI techniques to infer pedestrian activity from the signals, it’s clear in which bits of the city the fans gathered to watch the game, where the victorious Italian team paraded the trophy through the streets, and how this use of the city changed in response to events during or after the game. We then talk of how ‘dataviz’ like NYTE and Real-Time Rome may have a physical existence too, a presence in the city. Ratti certainly sees the possibilities in extending these information layers across mobile phones and web, onto the fabric of our streets and buildings, using LEDs and other technologies to enable quite fluid forms of display. He likes the idea of these clouds of pixels deployed around the street, the idea of the ‘liberated pixel’ not contained within the overbearing rectangular form of ‘the big screen’. Yet beyond installations, Ratti suggests that these kinds of real-time systems may actually radically reorient services such as transport, which are still wedded to the somewhat blunt Industrial Age artefacts of timetables and prescribed routes. Put simply, he says the bus could follow us, rather than us following the bus. As with the internet itself, this work comes from somewhere, and also has a history within architecture. Perhaps our roots are showing, but in terms of antecedents, I suggest (Brits) Archigram, Reyner Banham and Cedric Price, whereas Ratti references (Italians) Archizoom and Superstudio. Yet for Ratti, Buckminster Fuller’s concept of “comprehensive anticipatory design” provided most inspiration. His team, he says, are trying to define possible future urban conditions, which are articulated through design and then generate research responses. I suggest this approach – design and publish – is also close to Archigram and Superstudio, and Ratti particularly responds to the Superstudio comparison. He recalls their technique of creating radical visions of extreme or absurd conditions. In this sense, he thinks, they were not anticipatory, instead extrapolating a present condition to absurdity, as with the Continuous Monument or its heritage-parodying proposal for flooding Florence. With these intense exaggerations of form and city, they were commentaries on contemporary conditions, almost as a science fiction writer will almost inevitably write about today when depicting visions of tomorrow. Ratti is clearly drawn by this idea of exaggeration and extrapolation, almost to the point of absurd reductions, and I wonder whether there’s a link with Real-Time Rome, where instead of addressing the vast richness of all of city life, we use only mobile phone data to tell a story about the city. It’s a slice through the city on only one axis, which is a slightly absurd thing to do. Yet it still enables interpretation. It still speaks of now. Ratti agrees, but then outlines the possibility of accreting layers of such data – in partnership with the buses, the taxis, the wider city – to create a platform for exploring the city through data. In this, his aspirations are indeed closer to Fuller than Superstudio, as it becomes a form of anticipatory design. He doesn’t think you can show the city of the future as it will be, but you can see real-time information along one slice, one axis, and this enables us to anticipate a future city where perhaps the majority of the urban activity will generate impossible swathes of real-time data. I wonder whether we can almost think of information as a material in a sense, in terms of it having its own capabilities, qualities and performance criteria. Ratti responds by saying that there’s no doubt that the digital revolution has genuinely changed the way we do things, the way we live, the way we interact and talk with others. And rapidly too, as if 1993 was 50 years ago in “internet years”. He thinks there are similar conditions here as those that Le Corbusier reflected upon in 1929, when he saw a machine civilisation looking for and finding its architectural expression. Clearly Ratti believes that this age too has now begun its search. I found this video on the web today. AEC Facade Visualization from Claus Helfenschneider on Vimeo. The digital work and art is fascinating. This level of digital media integration at the urban scale has been floating around architectural circles since the 1970s. The problem as I see it, is seeing such measures are achieved now, the architecture is completely destroyed. The avatar is shrouded by a cheap veil of blinking and pulsing lights which will become kitsch far too easily. Claus' work here is nice, but I am worried about the greater damage which architecture will suffer if we keep practicing such masochism regarding the product. 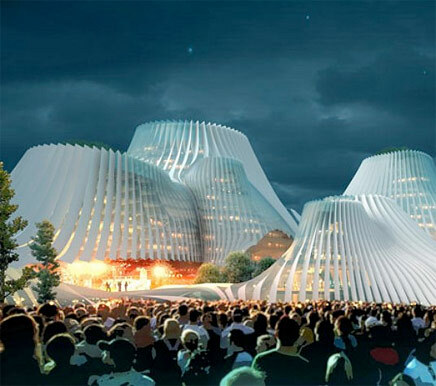 Beijing-based MAD Architects recently recently unveiled their design for a new convention center in Taiwan with a �skin� that will naturally ventilate the structure and generate energy from solar power. The Taichung Convention Center center is intended to become a new local landmark and help redefine the cultural landscape of the city, while also drawing attention to sustainable development and growth. Inhabitat. There’s a slide in my current presentation deck asserting that one of the transitions cities can expect to undergo in the turn toward a fully robust networked urbanism is that from “constant” to “variable.” I’m often asked just what I mean by this, and I’d like to use the following example – first suggested to me by Kevin Slavin – as a jumping-off point for the discussion. Nestled at the intersection of two autobahnen some five miles north-northeast of central Munich lies an enormous torus whose surface is quilted with thousands of silvery facets set in a diamond grid – 2,874 of them, to be precise. The street on which the torus sits is named for Werner Heisenberg, the legendary 20th Century physicist who first articulated the principle of formal uncertainty often associated with his name, and as we shall see, this turns out to be curiously apropos. This is the Allianz Arena, a football stadium designed by the highly-regarded Swiss architectural firm of Jacques Herzog & Pierre de Meuron, and the facets might be taken as something of a minor motif in the firm’s output. Superficially, at least, Allianz appears to employ a vocabulary of form similar to that the partnership had previously used to great effect on their exquisite, jewel-like building for Prada in the Aoyama district of Tokyo. But where the latter is a structure designed for low traffic and a single, very specific type of user, the Allianz is a building meant from the very beginning for the masses. At least two masses, actually, and those starkly different from one another. For as it happens, Munich is home to not one but two football clubs: TSV 1860 München, whose at-home uniform is blue, and FC Bayern München, who wear red. Nor are these the only teams who might plausibly claim Allianz as home ground: the German national team also occasionally plays matches there, and their color is white. Responding to the diverging requirements of 1860 and FCB, as they alternate possession on a near-daily basis during the Bundesliga season, is a nontrivial exercise for any structure the size of a stadium. And as anyone even slightly acquainted with a football supporter can imagine, this is if anything even truer as regards the two teams’ respective followers. Most arenas facing a similar situation might acknowledge the alternation of teams and audiences by some superficially convincing means – perhaps by swapping out the banners and flags hung about the peristyle. But the remarkable thing about Allianz is that the building itself has been given a way to address this change in conditions. The structure’s exoskeleton is wrapped with a lightweight foil of ethylene tetrafluoroethylene, or ETFE. And where ordinarily, one of ETFE’s notable properties is its very high degree of transparency, in this case each panel has been stippled with a fritting of miniscule dots. The result is a milky semi-opacity that, when backlit by tunable LEDs, causes each panel to emit a highly-saturated glow of whatever color desired. Now intensely red, now a truly uncanny blue: one structure, but two very different buildings. For anyone in the crowd, the effect – on mood, on sense of presence, on awareness of the surrounding space, on perception of belonging to some larger community – is nothing less than total. Change some settings, and you change the kind of person who will feel at home in the building, the range of things they will feel comfortable expressing and doing there, and more generally the possibilities for collective action. A thought experiment: take things one simple step further. Open those settings up; plug them into the global data network in such a way as to close a feedback loop between the building and all the people currently using it. And by so doing, couple the building’s radiant color to spectators’ average heart rate, level of activity or emotional state. Connect those parameters to outside control, and you can think of that entire building, its affect and meaning, as an asset of the network. At a crucial moment, the opposing team scores a telling goal. Suddenly you’ve got the ability to modulate and dampen the crowd’s disappointment or, if you so choose, heighten and exacerbate it. Write a few lines of code mapping different patterns of illumination to various contingencies that may arise, and the building becomes a subtler tool, one you can use to settle and reassure, to tweak and goad, even to urge a swift and orderly flow to the exits. This is new-media theorist Lev Manovich, describing a very different building – Lars Spuybroek’s Water Pavilion – in a 2002 essay: “Its continuously changing surfaces illustrate the key effect of a computer revolution: substitution of every constant by a variable.” In this case, Manovich is specifically referring to the effect of computational design on the contours of a single building, but it’s a profoundly insightful comment, and it points directly at the question of interest. Driven by networked computation, architecture – that slowest-moving and stateliest of arts – is learning to dance. What’s at stake is nothing less than the basic phenomenology of buildings, and of the cities composed of buildings: how they exist in the world, how we encounter them, what possibilities they afford us. We’re used to buildings being one color or another, confronting us with this shape or another, holding one consistent form and aspect for as long as we care to engage them, and all of these verities are now coming into question. I hardly need to point out that cities are infinitely more than collections of buildings. By the same token, though, the exterior surfaces of buildings, and the negative spaces and voids they define, constitute primary conditions for urban experience. And when these envelopes and hollows – thanks to their investment with computational sensing and response – become subject to change over time scales far shorter than those to which we’ve become accustomed, it’s clear to me that we’re talking about a new and very different set of prospects and potentials for the city. Evidemment, je rementionne dans le contexte de l'article d' A . Greenfield notre projet de recherche terminé il y a deux ans sur la question de la variabilité. Nous avions alors entièrement thématisé cette idée de la "ville variable" ou des "environnement variables" (voir lien ci-dessus), en réalité vieux "serpent de mer" de l'architeture. Toutefois je ne suis pas entièrement Greenfield dans ses conclusions et il y a là à mon sens une des grosses erreurs de l'architecture dite interactive: le bâtiment qui "reflète l'activité de ..." ou "l'état de ... (ses utilisateurs)", etc. Bien sûr, cela peut-être très beau à observer de l'extérieur et dans le cas décrit par Greefield pour l'aréna en particulier (voir l'architecture "pulser" au rythme des émotions du public) mais être par contre totalement inintéressant à habiter: imaginez vivre dans un environnement qui ne propose que de l'"enfermement" (c'est à dire qu'il vous dit et reconfirme --enfermement-- ce que vous êtes en train de faire). Je crois qu'un bonne architecture à quelquechose de beaucoup plus ouvert: on y habite, on y crée (des manières d'habiter) et celles-ci évoluent, varient. L'architecture doit je crois proposer de l'ouverture (de l'air! ), créer du décallage ou éventuellent solliciter les émotions, les sens et l'intellects de ses habitants: tout le contraire d'un miroir. Bref, je crois qu'il y a encore beaucoup à réfléchir sur le sens sde l'interactivité en architecture.